The words “Sweden” and “turbo” are generally associated with Saab when used in the same sentence. However, Volvo jumped on the ever-crowded forced-induction bandwagon in 1981 when it introduced a turbocharged version of the 240 that offered motorists 155 horses under the skinny pedal. The sedan was capable of sprinting to 62 mph from a stop in nine seconds flat, and it reached a top speed of 121 mph. Those figures were impressive in the early 1980s; in fact, the 245 Turbo earned the honor of being the fastest station wagon on the planet. Volvo got the chance to show what the 240 Turbo was capable of in 1982 when new Group A regulations were introduced by FISA. To be eligible for Group A, a car had to offer at least four seats, it had to meet a weight requirement that was calculated based on the displacement of the engine, and at least 5,000 examples of it had to roll off the assembly line annually. The 240 Turbo satisfied every requirement on the list, so Volvo asked a small team of engineers to turn the hot-rodded family car into a track machine capable of beating Europe’s finest in touring car races all over the continent. Power for the race-spec 240 came from a 2.1-liter four-cylinder engine upgraded with forged pistons, forged connecting rods, a forged crankshaft, and an aluminum head. The mill delivered about 300 horsepower in its most basic state of tune thanks to a race-specific Bosch K-Jetronic fuel injection system and a Garrett turbocharger that delivered 1.5 bars of boost. 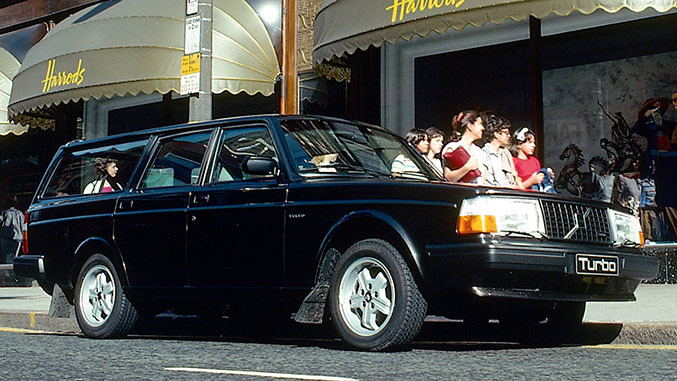 The 240 wasn’t the most aerodynamic car on the planet, so Volvo built every detachable body panel out of thinner metal in order to save weight. All told, the 240 could cruise at over 160 mph when given enough tarmac, and ventilated discs gripped by four-piston calipers kept the turbo four in check. Group A regulations asked car makers to build at least 500 street-legal examples of each race car. Volvo responded by introducing the 240 Turbo Evolution which benefitted from a bigger turbo than the stock model, a re-calibrated engine control system, and an innovative feature called Water Turbo Traction that injected a tiny spray of water into the intake to reduce the temperature of the air entering the combustion chambers. Volvo’s Water Turbo Traction technology boosted the power output of the 240’s turbo four. Water Turbo Traction will sound familiar to enthusiasts who stay up-to-date on new cars, though the technology is no longer found under the hood of a Volvo. Last October, BMW introduced a limited-edition version of the M4 dubbed GTS that boasts a similar (albeit more advanced) water-injection system. The 500 examples of the 240 Evolution were shown to race regulators in two separate batches located on the east and west coast of the United States, respectively, in July of 1983. Volvo was consequently given the green light to race in the 1984 season of the European Touring Car Championship, but the company decided to simply sell cars and parts to independent teams. The 240 Turbo would go on to win just two races that year, one in Belgium and one in Germany, and the Volvo disappointingly finished third in its class behind Jaguar and BMW. Determined to win, Volvo sponsored two official factory teams the following year called Volvo Dealer Team Europe and Magnum Racing, respectively. The 1985 season got off to a bad start for the Gothenburg-based firm because Rover’s V8-powered Vitesse won the first three events held in Italy – on the outskirts of Rome and on the storied Monza track – and in Donington, England. The 240 picked up the pace, fended off fierce competition from the aforementioned Vitesse and the BMW 635 CSi, and went on to win six of the 14 races held that year. 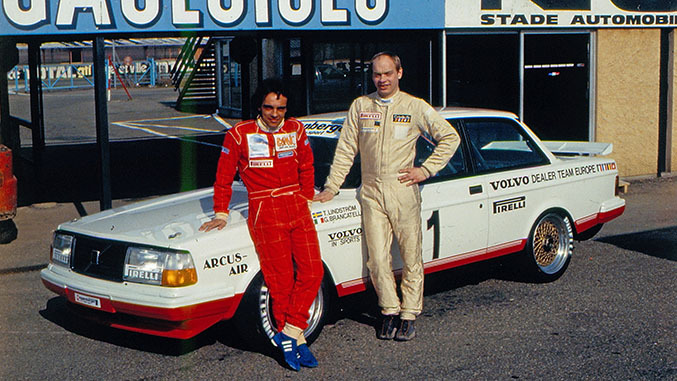 Volvo won the vaunted driver’s championship after a 240 Turbo driven by Gianfranco Brancatelli and Thomas Lindström finished first in a race held in October on the Estoril track in Portugal. The win almost didn’t happen because Volvo nearly got kicked out of the championship halfway through the season when race officials questioned whether 500 Evolution cars had actually been built. FISA ultimately settled the matter by asking Volvo to release a list of the 500 customers who had purchased an Evolution car. Volvo took a long time to reply and the matter was highly controversial in motorsport circles, but the company ultimately published a comprehensive list of the Swedish motorists who had taken delivery of a 240 Evolution. Volvo was cleared, and it was allowed to participate in the rest of the season. Volvo raced again in 1986 with an evolution of the 240 Turbo that turned the dial up to 11 with a 380-horsepower engine and traction control. However, the company was unable to replicate the success of the 1985 season so it once again took third in class, this time behind BMW and Rover. 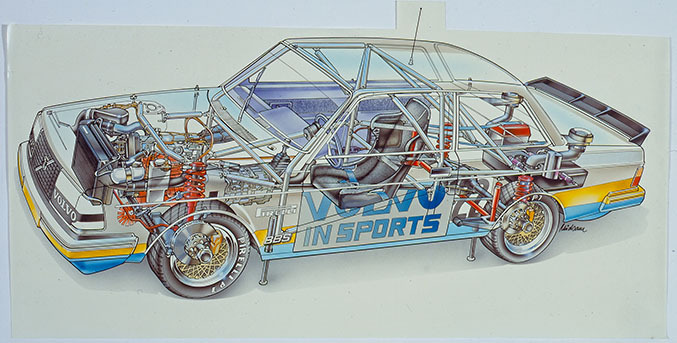 Company executives decided to shut down Volvo’s Motorsport Division and pull out of racing altogether, but privateers continued to race – and win – with the 240 Turbo well into the late 1980s.